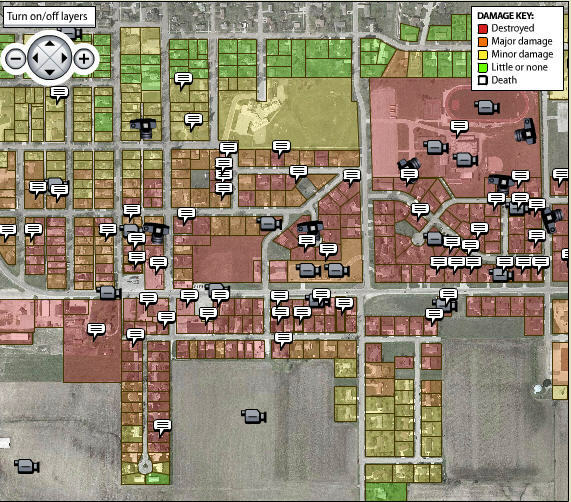 After a tornado wiped out a third of a nearby town on Memorial Day, the Des Moines Register created an interactive map on its Web site that lets users “see the breathtaking scope of the disaster house-by-house, with photos and stories from the survivors.” The map is color-coded to show the level of damage, and overlaid with icons that link to photos, video and stories. The newspaper asked people in Parkersburg to submit stories and photos. Many sent in “before” pictures of what their homes looked like before the tornado hit. They’re posted alongside photos of what was left after the storm. The full package goes even deeper, linking to slide shows, 360-degree panoramas and and existing features on the site. The paper’s Iowa Tornado Tracker is a Google map mash-up showing the location of every tornado in Iowa since 1976. Each pushpin on the map gives details on the storm and has a link inviting readers to “Click here to tell your story.” There’s also a link to information on how to help tornado victims, but unfortunately, it’s not working at the moment. With TV news or still photos in the paper you see one or two houses, or aerials, but when you can look at before/after pictures, house by house, you can almost see your house. One of these houses is like yours and you can begin to understand what it does to your life. One of the most riveting segments in the feature is a brief video from the surveillance cameras at First State Bank that somehow survived the storm. You can see the tornado slam into the building; the exterior camera captured the storm peeling the roof off a neighboring house. So add this suggestion to your tool bag when you set off to cover a natural disaster: Don’t just ask for home video. Go after footage from robo-cameras installed everywhere from banks to convenience stores to schools. You never know what you might find.